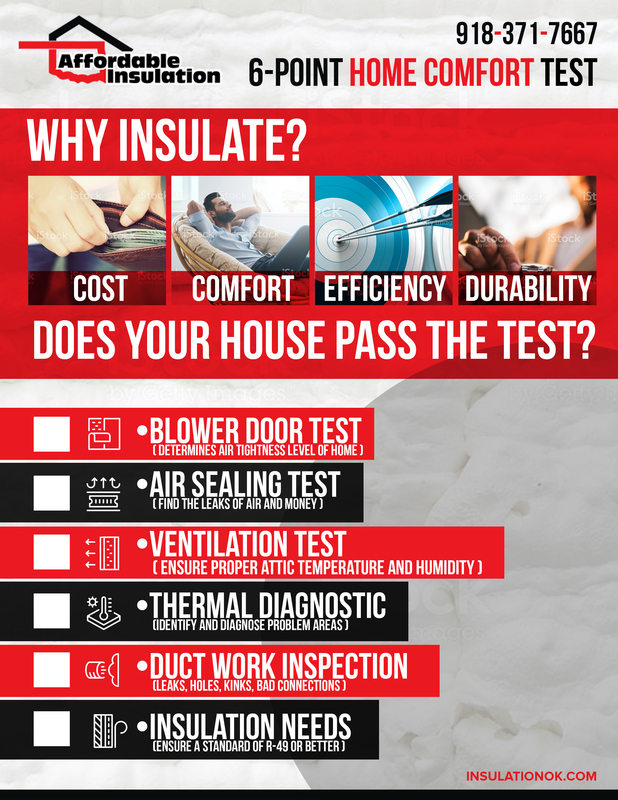 By conducting a blower door test, Affordable Insulation is able to determine just how “leaky” your home is and exactly how to fix it. Your home has a building tightness limit…in order to find the limit we conduct a blower test to evaluate your homes “tightness”. From this baseline we are able to find air leakage using thermal imaging. We have pinpointed the problem! Once the blower door test is complete, using BPI standards, we calculate where your house is the current state of your home and where it needs to be to meet standards. Air leakage in your home causes comfort issues and high utility costs. Most home owners are amazed at how much 1 electrical outlet can leak….we will show you! Ventilation needs to occur in your home with a vented attic assembly to maximize your comfort and utility cost. Not enough low side (soffit ventilation) to high side (static vents) ventilation causes excess heat load and eventually finds its way into the living space…where you are…causing you to be HOT. Poor or lacking ventilation can cause mold, allergies and “ice damming” in your attic…all these things cause you to spend more money. A thermal camera shows hot and cold air in an infrared picture. These pictures are able to identify air leakage and high moisture areas. This gives you piece of mind. This allows us to identify the costly issues of your homes performance. Thermal images prove what’s really going on. We visually inspect your ductwork in the attic. We are looking for pitched ducts, disconnected ducts, leaky ducts areas. Most all ducts leak…we can find where they are and seal them so they don’t leak. This simple step saves you a lot of money. Ductwork is often uninsulated in an attic…That makes no sense..hot or cold air in an hot or cold environment with no insulation. We address these issues. We also make sure all of your duct work that is supposed to be vented outside is in fact vented outside. Most bath fans aren’t causing heat and moisture in your attic. We hope we don’t find any ducks in your ducts…. Insulation is important..In fact you have to have it or you are just wasting money. We do all 5 other test before we insulate. You can air seal and insulate but never insulate without air sealing. IF you do…..you jeopardizing the durability of your home. Insulation is not all equal and doesn’t all do the same thing. There are different types for different results. Don’t worry we are insulation experts..we will go over all the different avenues with you.